Oh! You Got a Helicopter! Two nights ago, about 30 minutes after I fell asleep, I woke up to see bf moving around the room. I couldn’t tell what, but there was something else hovering in the air just past the bed. He gave a bemused laugh and told me no, he had not gotten a helicopter. Just then, I could see clearly. He was there sitting next to me as usual. A lamp was lit. I’m wasn’t dark. Nothing was flying around the room. Oh, it was a hallucination. He said oh, and took it in stride. This is not the first time I have talked about things that weren’t there. I’ve been given a reprieve. I started estrogen (back in spring of 2017). And many physical symptoms of *whateverthehellthisis* ebbed. My head cleared a bit. I regained what feels like my full field of view. I don’t see many movement hallucinations in my peripheral vision. I can usually remember what conversation I’m in while I’m in it. The stuff is all still there, but it doesn’t rule every minute of every day. But I feel like a ticking time bomb. How long do I have before BOOM!? Am I the only person in the world to experience this? Is there no doctor who would explore the connection between estrogen and my neurological problems? Not that my experience represents a majority of women with neurological problems after menopause…but I can’t possibly be the only one. I couldn’t teach my physics lab a few weeks back because of confusion, for the first time. My colleagues covered for me. It was such a rough week. My Monday lab was taught by the professor whose office I landed in, an hour before class, in tears. He knows I have neurological problems; he didn’t know memory loss was one of them. And despite the uncertainty of my future, he showed every confidence that I can finish out the semester; that no matter what happens, I am still a contributing member of the faculty. When I taught my next scheduled class, I made some vague excuse about some vague illness. The students bought it. They have no reason not to. But it felt icky, because I was not being true to myself. So then, I resolved to tell my students that I have memory loss and that was why I could not work that week…and that is why I still can’t learn their names and that is why I sometimes stop at the board and forget what I am doing and that is why I sometimes substitute words without realizing. So then, I told my next class that I have early onset memory loss and I don’t really know what’s going on. OH MY GOD what a relief. I have been working SO HARD to hide the shame of my changing brain! No hiding, no shame. Two of the students in this class…my first coming out class…pre-med students, were fascinated by my story. Rather than telling me that my experiences couldn’t possibly be, they asked me questions. I will always have a special place in my heart for these two young women…my brain will probably forget them, but my heart won’t. I found myself outside today, shoveling snow in my long johns. But guess what…neighbors see me out-of-doors in my underwear and what do they think? Oh that poor thing out in the snow in her underwear…poor thing really is losing her marbles. They don’t know that I’d have been out there just like this, thirty years ago. Now I can use “memory loss” as an excuse for just being me. Cool. What is my responsibility to my BF, knowning that my mind is dementing…as we speak? I WILL NOT drain you of money and/or resources that should go to your children. No way. My Mother has money. Make sure it goes where it should…as little as possible on me, the rest a resource for Offspring. My love for you transcends here and now. Love and respect me…but TAKE CARE OF YOUR HEART, even when I can’t. Especially then. Someday I’ll remember I told you this, but I won’t understand why or how. Be patient with that version of me. She can’t make sense of this world. But she loves you completely. Be open to love. Just I hope you wait until I’m a but further gone than I am now. That’s all I got tonight. Thank you for the amazing dinner. Happy π Day. My love. 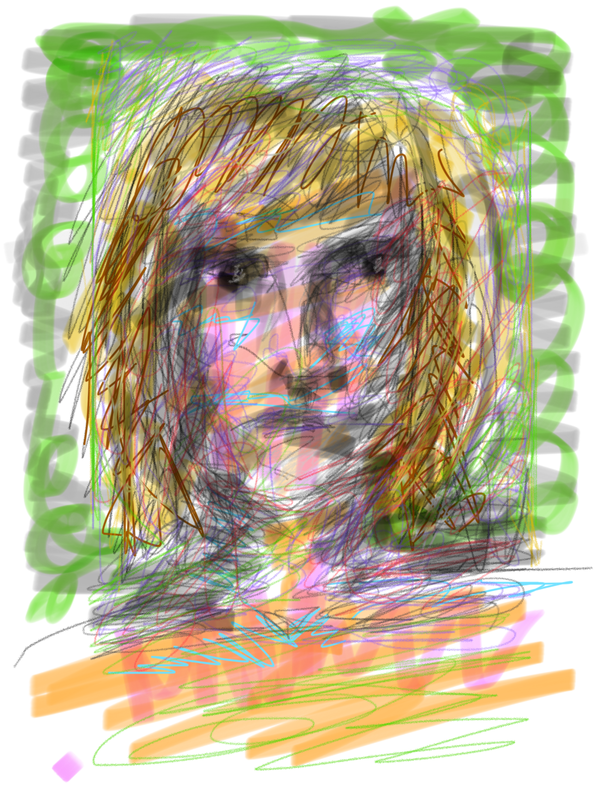 Drawn using Note on iPhone.